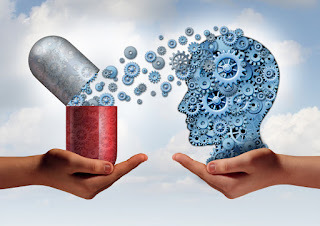 To strengthen the patient gradually. See that the chair or wheelchair is in good condition. Place the chair conveniently at night angles to the bed—back of chair parallel to the foot of the bed and facing the head of bed. Place pillow on the seat of the chair. If using wheelchair, line it with a blanket or sheet and arrange pillows on the seat and against the back. Put the foot rest up and lock the wheels. 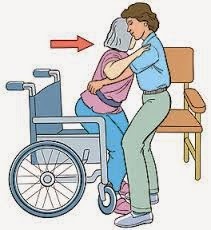 Assist the patient to a sitting position on bed, i.e., put one arm under the head and shoulders and the other arm under her knees and pivot her to a sitting position with the legs hanging over the side of the bed. Watch the patient for a minute to defect any change in his color, pulse and respiratory rate. Put on patient’s robe and slippers. Place the foot stool under the patient’s feet. Stand directly in front of the patient and with a hand under each axilla, assist him to stand, step down and turn around, with his back to the chair. Let patient flex his knees and lower body to seat him to the chair. Anchor chair with foot or have someone hold it on. (Or let patient place his arm over your shoulders while you put your arm around his waist. Turn patient around with his back to the chair and seat him gently). Help him get comfortable in the chair. Adjust the pillows and wrap blanket over patient’s lap. If in a wheelchair adjust the foot rests. Observe frequently for changes in color and pulse rate, dizziness or sign of fatigue. To put him back to bed, assist to stand, help to turn and stand on stool and back to bed. Support patient while he sits on the side of bed. Remove robe and slippers. Pivot to a sitting position in bed, supporting her head and shoulders with one arm and her knees with the other arm, and lower slowly to bed in lying position. Draw up bedding. Take pulse after.